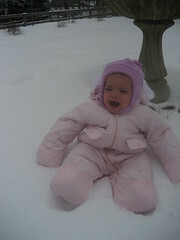 When I woke up Tuesday morning, there was snow everywhere! 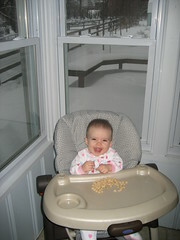 But before we could go outside, Mom said I had to eat my Cheerios. 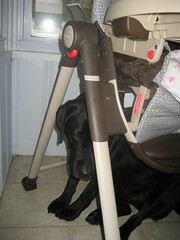 As always, Tucker sat underneath my highchair, waiting for me to drop some (or feed him some when Mom isn’t looking). 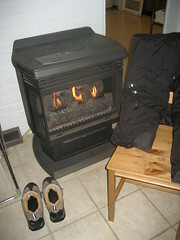 Dad shoveled the driveway, and then dried his snow pants and boots by the fire. After Dad went to work and I ate my breakfast, Mom finally bundled me up and took me outside. And can you believe she actually put me down? In the snow? I calmly let her know I didn’t like that. So she picked me up and we walked all the way to the back of the yard. 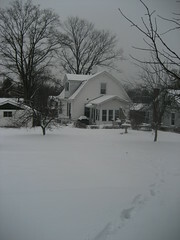 This is what our house looks like from there! 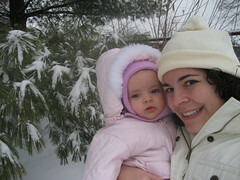 Mom took a picture of both of us, in front of a tall, tall pine tree. Then we went back inside and ate cinnamon oatmeal cookies. This entry was written by kara, posted on January 30, 2009 at 11:38 pm, filed under Uncategorized. Bookmark the permalink. Follow any comments here with the RSS feed for this post. Post a comment or leave a trackback: Trackback URL.